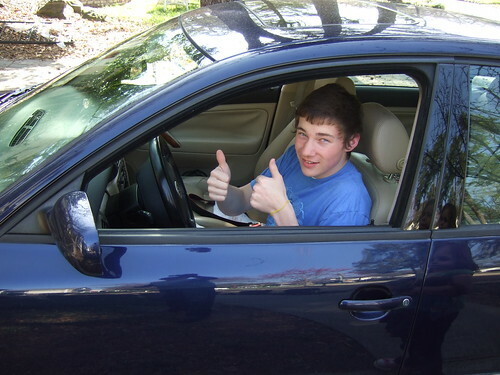 There are so many safety factors to consider when your teenager begins driving. When it comes to teen brain development, distracted driving, and graduated license laws, parents have a strong role in ensuring that their children stay safe behind the wheel. Great safety strategies include educating your teen about the dangers of distracted driving, and creating a teen-parent safe driving contract that rewards safe driving behavior. Parents also have the power to be a role model. Demonstrating safe driving can make a huge difference in your teenagers’ driving skills. However, there’s one aspect for new teen drivers that parents have complete control over: what car (if any) they will drive. There are a lot of no-brainers here. It’s not advisable, for example, to buy your newly-licensed teenager a brand new Lamborghini or Corvette. I mean, why tempt them? You also probably want to avoid clunky SUVs or massive Hummers, which are often difficult to handle and can cost a fortune when it comes to gas bills. But aside from these considerations, there are so many factors to weigh, and it can help to have car and safety experts to parse the details. For example, the Insurance Institute for Highway Safety, a nonprofit organization in the United States that is focused on preventing crashes and reducing the damage done by crashes where possible, have some criteria that they use for their recently updated list (November 1, 2018!) in terms of car safety specifically for teenagers. With this criteria in mind, their list was an excellent resource in making our own list for our readers. The objective of our list is not to detract from their list, but instead to accentuate it and to make it into a possibly less overwhelming format all on one page! We will also be using other sources to inform our more limited choices. After all, the Insurance Institute for Highway Safety’s list has 53 ‘best choices’ for under $20,000 and 62 ‘good choices’ for under $10,000. That’s a lot of cars to discuss! We’ll instead be doing a list of seven cars in a more easily digestible format, four for under $20,000 and three from under $10,000. Now, the Insurance Institute for Highway Safety does include different kinds of cars and trucks in their lists, including pickup trucks and SUVs, small and large, minivans, and cars, large and midsize. We will be discussing primarily the average car, but we will also mention standout trucks, SUVs, and minivans. However, we do not recommend getting a minivan or a truck due to the safety concerns that we have with them. If you have any issues with our format or how we’re doing this, we’d love to hear from you! Please post in the comments below or contact us through facebook or the blog. However, a disclaimer from us is that we do recommend spending more than $20,000 for a car if it has better safety ratings than the cars we have listed down below, however, we do realize that this is not always feasible for teenagers and their parents because, after all, kids are expensive! Therefore, we’ve curated this list from the Insurance Institute for Highway Safety in a more readable format for you to peruse and to consider these things. We’ve also compiled a list of safety requirements for you to reference to when looking for cars from the Insurance Institute for Highway Safety below the two lists. Do keep in mind that the prices listed here may be wrong for your area, and may not take into account wear and tear on the car. Price: ~10,000 for a 2013 version, 25,000 for a new 2018 version, anywhere in between for 2014, 2015, 2016, and 2017. Built-in safety features (2013 and on): “Side airbags: front and rear head curtain airbags and front seat-mounted torso airbags”, “Rollover sensor: designed to deploy the side curtain airbags in the event of an impending rollover”, “electronic stability control”, “antilock brakes”, “daytime running lights”. Headlights: Acceptable for all models tested except 2018, which are listed as Good. Recalls: Less than five individually for all models suggested here, 2013 and 2015 being the highest at 5 each. The Outback. While the 2018 version is more expensive than the 20,000 maximum that we have here, we could not resist including it here. The 2018 version has great safety ratings across the board. The 2013 version was picked by the Insurance Institute for Highway Safety as a “Top Safety Pick+”. While it may not be as cool or flashy as some of the cars that your teenager wants to drive, the utility and the functionality may pay off for them if they’re an outdoorsy type at all (it is great for camping, glamping, biking, backpacking, hiking, climbing, and so on and so forth), or they play sports with lots of equipment (lacrosse and football are two offenders here!) and they want to take their teammates out to practice. Discussion and negotiation can be had here between your teenager and you as far as this car goes, but all that being said, the Subaru Outback is a solid car and you cannot go wrong with it. Price: ~11,500 for a 2014 version. Headlights: Acceptable for all models tested. Recalls: 8 for the 2014 version, less for the others. The Rogue, the SUV for us. Deserving of a Top Safety Pick+ from the Insurance Institute for Highway Safety, Nissan has made some amazingly safe cars recently, and the Rogue is no different. Indeed, before 2014, their track record wasn’t the best on the Rogue. Their rating in 2013 (and previous years) for a category was ‘marginal’, which is worse than acceptable for the Insurance Institute for Highway Safety. It was ‘good’ in 2014, and that solid track record has stayed in the years since. An area of concern here is the ‘latch’ rating, which measures child seat safety, however, since this is for your teenager to drive, unless they’re planning on taking a nannying job for a young child or a similar situation, the Nissan Rogue should be completely safe. Discuss these situations and concerns with your teenager, and if you feel the need to go with another car because of the ‘latch’ rating, then do so. Otherwise, the Nissan Rogue will be an excellent SUV for the appropriate teenager. Price: ~18,100 for a 2016 version. Built-in safety features (2013 and on): “Side airbags: front and rear head curtain airbags and front seat-mounted torso airbags”, “Rollover sensor: designed to deploy the side curtain airbags in the event of an impending rollover”, “electronic stability control”, “antilock brakes”, “daytime running lights”, “driver and front passenger knee airbags: separate airbags in the lower instrument panel designed to minimize knee injuries in frontal crashes (beginning with 2016 models)”. Headlights: Poor for 2016, 2017. Marginal for 2018. Recalls: 4 for 2016, 4 for 2017, and 0 for 2018. Sometimes your kid needs a pickup truck, so we’ve decided to include one here. The Toyota Tacoma Access Cab has the ratings necessary for the Insurance Institute for Highway Safety to suggest it, and it is the only small pickup truck on their list. We suggest this only for the appropriate situation, and this is definitely something that you should discuss with your teenager as to if they actually need a pickup truck. The headlights rated pretty poorly in comparison to the other vehicles on this list, so we’re suggesting that your teenager only drive this during the day. Trucks are not the safest vehicles around, but this is going to be the safest and affordable one provided your teenager needs it. Recalls: 4 for the 2014 version, less for the others. Notably, zero for 2016 and on. The only luxury vehicle in our suggestions, the Acura RLX is deserving of a Top Safety Pick+ from the start in 2014, and it’s only gotten better. The safety featured in the Acura RLX is the reason why it is the only luxury vehicle in our eight suggestions. In fact, it has zero recall issues from 2016 and on. The only points of contention are the headlights and the latch rating. As stated with the other cars above, discuss with your teenager about how and when they will need the car. If they will need to ferry young children around, give this vehicle a pass. If they do not, then give this one a serious gander because you’re not gonna find much better safety-wise in the price range. Price: ~$8,900 for a 2013 version, 23,800 for a new 2018 version, anywhere in between for 2014, 2015, 2016, and 2017. Recalls: Be especially careful here, as many of the models newer than 2013 have gotten as many as eleven recalls. Make sure that you get your used cars’ repair and recall history! There have been less per year since the 2016 model. Sedans are functional cars that can be used to transport your teenager safely. We consider the Nissan Altima Sedan one of the best cars that can be gotten for relatively cheap. It is an average car that comes in average colors. Good for teenagers that may not want to stand out in the crowd, this car has safety ratings that are great for its’ price range. We can only recommend the 2013 version and on because the older the Nissan Altima gets, the worse the ratings get according to the Insurance Institute for Highway Safety. Built-in safety features (2010, 2011, 2012): “Side airbags: front and rear head curtain airbags and front seat-mounted torso airbags”, “Rollover sensor: designed to deploy the side curtain airbags in the event of an impending rollover”, “electronic stability control”, “antilock brakes”, “daytime running lights”. Recalls: 11 for the 2010 model, 9 for the 2011 and the 2012 models — Typical for older models. The Outback again. We cannot emphasize how solid this car has been for the last eight years. The 2010, 2011, 2012 models are under 10,000 as opposed to the 2013 and newer versions, so we decided to include it here again. The ratings that were tested are the same as in the newer versions. We can guess based on trends from the testings that we’ve seen in other cars that the older cars are worse safety-wise in terms of the “small overlap front” rating, but we cannot guarantee that without testing. The Outback, again, is a solid car and you cannot go wrong with any year in the last eight years. The newer ones are going to be better, but you cannot go wrong with any of them safety-wise as far as the ratings go. For those who are unwilling to deal with the recalls of the earlier Outbacks, here’s an alternative. The Kia Optima is a midsized sedan and it has great safety records, though there’s a marked uptick of quality as you get up in years. This car is a bit cheaper than the Nissan Altima. The 2011 version of it has a ‘Top Safety Pick’ classification from the Insurance Institute for Highway Safety. “Use the Vehicle Identification Number to check for outstanding recalls before buying a used vehicle. To receive future recall notices, notify the manufacturer of your purchase. The National Highway Transportation Safety Administration, or NHTSA also advises vehicle owners to check its database for new recalls every six months or so.” You can find a link to the recall database that they mention here (https://www.nhtsa.gov/recalls). All of the details on how to find the information for the car is on the front page of that database. This can be done for a car that you are considering buying, even! Again, the NHTSA emphasize doing it every six months, so put it in your calendar! The Insurance Institute for Highway Safety also recommends that you check if the car has been repaired if there has indeed been a recall. “Lane-departure warning and lane-keeping assist help prevent lane-departure crashes. Blind-spot detection alerts drivers to nearby vehicles they might not see. Do not even consider cars without safety belts and airbags. According to the Insurance Institute for Highway Safety, “safety belts keep people in their seats and spread crash forces across the upper body’s stronger bony parts. Airbags protect people from hitting things inside the vehicle or objects outside it.” Obviously, these things are standard in 2018, but we cannot recommend that you get a car without these and highly encourage you to walk away from any car that does not have them. Visit the Insurance Institute of Highway Safety here (https://www.iihs.org/iihs) and the page where we accessed most of this information here (https://www.iihs.org/iihs/ratings/vehicles-for-teens) for more information on cars and safety.